This is the space you’ve been looking for. Centrally located in the Sorrento Mesa area of San Diego, just 2 minutes from the I-805 freeway. It’s beautiful, with 3000 sf. total, and a huge 25’wide x 35’long white-on-white shooting area with 14′ ceilings. That’s more than enough depth to shoot full length portraits with a long lens. Includes a full kitchen, shower, offices, and lobby waiting areas, and plenty of free parking. It’s big, impressive and air-conditioned. With our studio-wide Unistrut® overhead grid you can hang lights, drapes and backgrounds from any position. It also boasts (8) separate 20-amp circuits for big video shoots. Make your clients comfortable, and blow them away at the same time. Yes, it’s a working studio, but it’s much more. The front and side walls become giant video screens with bright, sharp, and impressive 25 foot diagonal 1080p video screens with our installed projectors. With Dolby® 5.1 Digital Surround Sound and 3 thumping subwoofers, it’s a private theater for Film Premiers. The space also works superbly for: Board Meetings, Video Conferencing, Product Launches, Art Openings, and even intimate Concerts. Limited only by your imagination. It’s all very affordable. 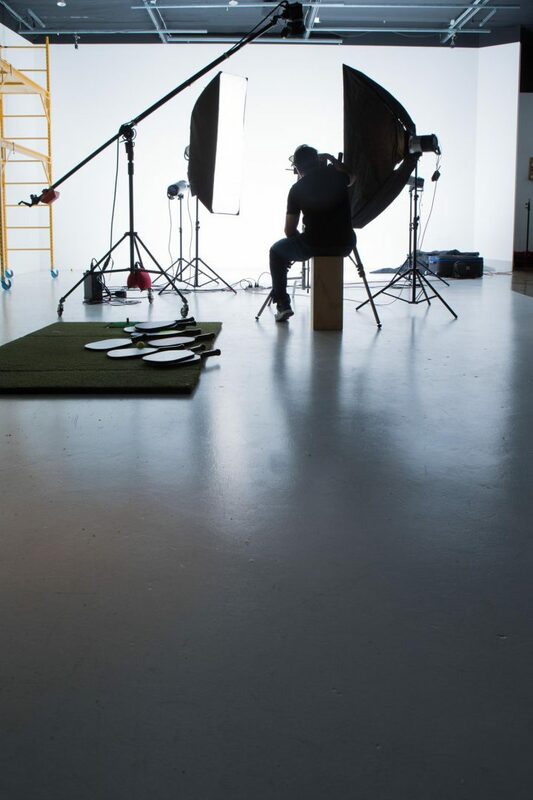 And we work on a sliding scale: Whether you’re an aspiring photographer, or it’s a full video shoot, or a corporate event, we’ll work with your budget. We can even do Golf Simulator outings for employee team building. Get your group together, and we’ll host your company: Hi-Def Golf Simulator on our 25′ Screens, and a BPGA Teaching Pro available. And there’s a Kegerator. What more could you ask for? Just click the Get A Quote button below.